Concrete NuBarrels™ give the winemaker complete control of oxygen, complete control of oak and feature sensors that communicate with a mobile device about fluid level and temperature. NuBarrels also stack to yield eight barrels worth of wine in the floorspace of less than two–all with the quality of concrete. Store or ferment more wine in less space and for a fraction of the cost of oak, all with the quality of concrete. The oak wine barrel is so much a part of the process of making wine that it’s real value and cost become overlooked. The innovation team at Sonoma Cast Stone has taken a fresh look at the function and benefits of the traditional oak barrel and found many areas of improvement. The conclusion has been the development of the NuBarrel™. After a series of refining the design, the NuBarrel™ will accomplish all the benefits of an oak barrel in a much smaller footprint and at a fraction of the cost. The natural conclusion is that this new approach might accomplish this, but that it would be at the expense of quality. The surprise is that the opposite is true. The concrete NuBarrel™ from Sonoma Cast Stone is a disruptive and breakthrough product, by any standards. Large wineries have annually recurring “cooperage” expenses in the millions of dollars. A barrel room full of concrete NuBarrels from Sonoma Cast Stone could see that drop to zero. Imagine winemakers watching over their precious inventory from anywhere by mobile device and needing to replace barrels every few decades rather than every few years. With the capacity of four oak barrels, the concrete NuBarrel™ will cost about $6,000. However, concrete vessels will produce wine for about ten times as long as oak barrels, so the concrete NuBarrel™ will ultimately yield about ten times as much wine for the same cost. There are intriguing, technological features, as well, including two options for introducing oak with precision and control. One, a rack system remains submerged within the tank. The second, an immersion sleeve, is accessible from outside of the tank. The sleeve allows the winemaker to effortlessly introduce a substance, alter it or even remove it incrementally during the fermentation process. Thus, the winemaker could introlduce full oak, partial oak or none at all. Meanwhile, a sensor inside the tank itself communicates by cell phone regarding fluid levels and temperatures. If conditions in the tank stray from desired settings, an alert will display both on the tank and on the winemaker’s phone or tablet. The winemaker can monitor his entire barrel room from remote. Further, concrete NuBarrels™ are designed to stack and bolt together in pairs, resulting in a more efficient use of floorspace, and a subsequently higher yield of wine per square-foot. A stacked pair of these tanks can store the volume of eight oak barrels in the floorspace of one and a half. One pair could also be shelved above another pair, for a further increase of yield. 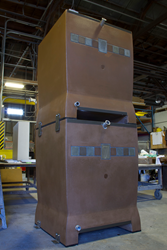 All Sonoma Cast Stone concrete wine tanks are made in America and seismically engineered for safety.